Despite the Flyers' mounting losses, there are reasons for hope. Honestly. Carter Hart looks like the Philadelphia Flyers’ goalie of the future. His progress at the junior level so far is a reason to get excited about the team. The Flyers have lost 10 straight and the clock may be ticking on their placid coach. They have fallen into the Metropolitan Division basement, and have some fans turning apathetic, some turning angry. They are angry because one of the players the Flyers received in the trade that sent Brayden Schenn to St. Louis, high-priced Jori Lehtera, has zero goals in his first 17 games and has been playing instead of some youngsters. Schenn is among the NHL scoring leaders and could be headed to his first All-Star Game. They are apathetic – there were loads of empty seats for Tuesday's listless loss to San Jose — because the team seems to lack direction. Are the Flyers rebuilding for the future, or are they trying to sneak into the playoffs this season? If they were doing the former, they would be playing even more young players instead of veterans such as Lehtera and Dale Weise just because they are big bodies. BULLETIN: We interrupt this eulogy on the Flyers' season to bring some hope, some joy to those who follow the team. 1. The Flyers were supposed to be a team on the playoff bubble. They still are. When you play as many as six rookies, as the Flyers have in some recent games, there are growing pains. You have to live with them and realize that the youngsters on defense – Travis Sanheim, Robert Hagg, and even Ivan Provorov and Shayne Gostisbehere — are going to be better down the road because of the tough times this season. 2. The Schenn trade appears awful right now, but it has a chance to look good in the future. Some say the deal reminds them of the reverse of the great trade the Flyers made by acquiring John LeClair and Eric Desjardins from Montreal back in the day. Don't be too quick to judge this deal. Yes, getting Lehtera and his ridiculous contract for two years is an albatross, but the Flyers received a first-round pick in the 2017 draft, center Morgan Frost, who is turning heads in the Ontario Hockey League. And they will get St. Louis' first-round pick in 2018. The speedy Frost had 40 points, including 13 goals, and a league-best plus-28 rating in his first 26 games for Sault Ste. Marie. The 2018 first-round pick the Flyers select will probably fall in the 20s. The Flyers have drafted well in that area, getting players such as Claude Giroux (22nd overall), Simon Gagne (22nd), Mike Richards (24th), and Justin Williams (28th) in their respective draft classes. In addition to Frost, several other Flyers forward prospects are playing well: left winger Danick Martel and center Mike Vecchione with the AHL's Phantoms, centers Connor Bunnaman (OHL) and German Rubtsov (QMJHL), and 6-6 left winger Isaac Ratcliffe (OHL). 3. Goalie Carter Hart, chosen in the second round of the 2016 draft, is coming of age. This is probably the No. 1 reason to get excited about the Flyers' future. Hart, 19, has overcome a bout with mononucleosis and has been brilliant in the Western Hockey League, posting a 1.63 goals-against average and .951 save percentage in his first 12 outings this season. He is expected to be Canada's starter in the upcoming World Juniors. 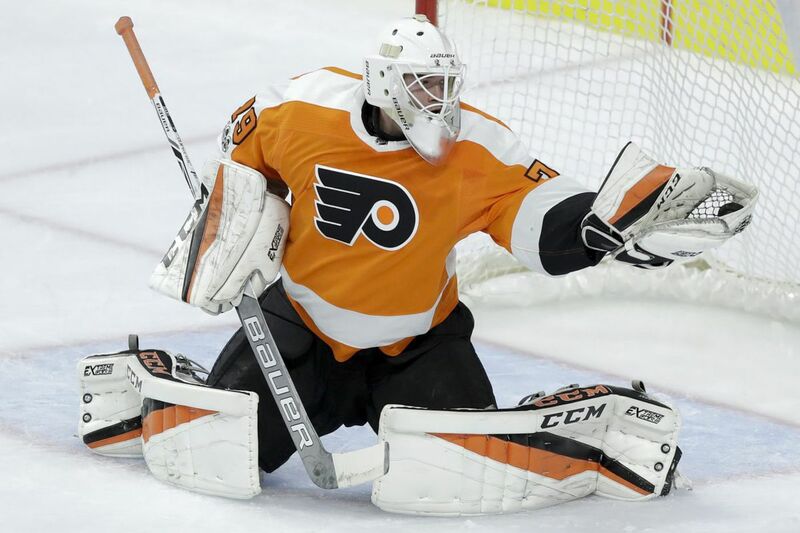 The hope is that after playing for the AHL's Phantoms next season, the 6-foot-2, 180-pound Hart will be NHL-ready in 2019-20. He looks like the Flyers' goalie of the future. 4. Cap space is coming! Cap space is coming! After this season, the contracts of Val Filppula ($5 million cap hit) and Matt Read ($3.63 million) come off the books, and Lehtera ($4.7 million) should be bought out of his final year. General manager Ron Hextall can be a player in a free-agent market that may include John Tavares, Evander Kane, and James van Riemsdyk. 5. As for the rest of this season, there are also positive signs. Really. A year ago, the Flyers were a poor five-on-five team, but they somehow put together a 10-game winning streak in which they got lots of favorable bounces. This year's losing streak has masked the fact the Flyers have been a very good even-strength team — ninth in the NHL entering the weekend. That is usually the best indicator of how a team fares in the standings. Unlike last year, the Flyers haven't been getting the bounces, but they usually even up over a long season. The Ian Laperriere-directed penalty kill, which has again been awful, will get better when Radko Gudas' 10-game suspension ends and he returns to the ice Dec. 12 against Toronto. In other words, better days are ahead for the Flyers.